Most birds are beneficial animals who serve an important role in the ecosystem, and they are appropriately protected by law from being intentionally killed or harassed. Doing so could land you in a lot of hot water. But there are three species of birds in the United States that are considered pests and that may be controlled even by killing them. These three species are the pigeon, the house sparrow, and the starling. Because of their significance as pests, in most United States municipalities, they can be controlled with no justification other than that the property owner doesn't like them. A fourth specie, the Canada Goose, is specifically protected by U.S. law, but may legally be chased away from areas where they are causing problems using methods that do not harm the geese. Most other birds can be controlled by non-lethal methods such as trapping and releasing them elsewhere; and almost all birds other than endangered or threatened species can be sealed out of homes and other human-occupied buildings if they're not currently tending a nest or raising young. More about harm-free methods to control geese and other birds can be found on the next page. Why are Some Birds Considered Pests? Pigeons, sparrows, and starling are considered pests because they exist in huge numbers, because they damage and deface property, and because they sometimes present a health and safety hazard. The most common reason why people want to get rid of birds is because they're defacing buildings or vehicles with their droppings, which are corrosive and difficult to remove. They also can cause damage to generators, air conditioners, and other machinery that requires cooling because their feathers can clog up the air intakes, filters, and fans. Birds also cause a hazard to human life around airports, where they can get sucked into jet engine intakes or damage aircraft that collide with them. Birds also cause health risks to humans, livestock, and domestic animals. Birds are involved in the transmission of several serious diseases including histoplasmosis, salmonella, ornithosis, avian flu, and other diseases. In addition, bird parasites (especially fleas, mites, and mosquitoes) can vector many other diseases including West Nile virus and Eastern equine encephalitis. Pigeons are the birds that pest control professionals are most frequently called upon to control. Originally introduced to North America from Europe as pets, pigeons rapidly proliferated and became pests in the absence of their natural enemies. Their huge flocks and filthy habits have led many people to refer to them as "flying rats." They are significant bird pests in both urban and rural areas. 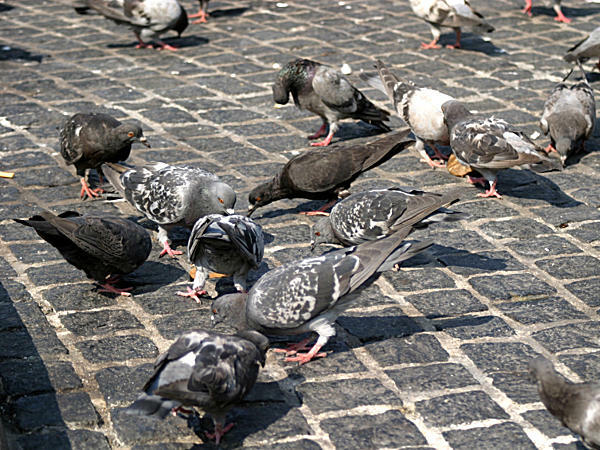 Pigeons are disliked and considered pests because they contaminate public areas with their droppings, deface monuments, and cause serious hazards to air travel. They also build nests on building ledges, under bridges and overpasses, inside illuminated signage, in church steeples and bell towers, in theater marquees, in outdoor amphitheaters and band shells, in radio and radar towers, and in many other places where their droppings, feathers, and shed parasites create a nuisance or a health and safety hazard. Unfortunately, some people aggravate the pigeon problem by feeding pigeons. This practice should be vigorously discouraged. Feeding pigeons conditions them to frequenting human-occupied areas to eat and building nests nearby those areas. Starlings are predominantly black, speckled birds that nest in protected areas such as hollow trees, roof soffits, rooftop mechanical equipment, elevator shafts, electrical boxes, and structural voids of buildings such as lofts, bell towers, and church steeples. From a distance, starlings' coloration appears quite dull; but when looked at more closely, the iridescent speckling becomes more apparent. During their breeding season, adult starlings' beaks turn bright yellow. Young starlings often associate into huge flocks whose droppings deface and damage structures and monuments. Because they're smaller than pigeons, they can get into places where pigeons can't, making them that much more of a nuisance. 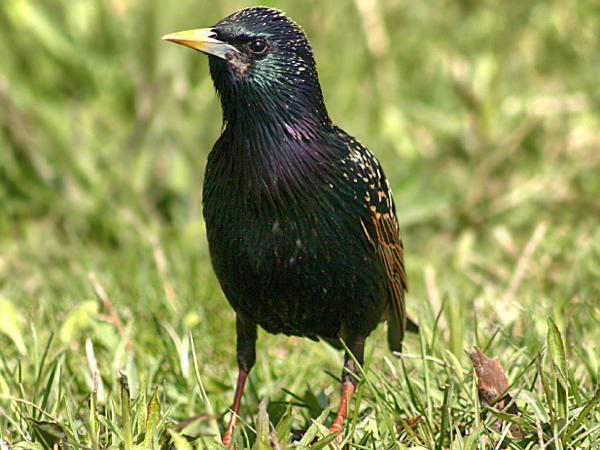 Starlings also are "bully" birds who attack and intimidate other birds, evict them from their nests, and move in themselves. This aggressive behavior is believed to have contributed to the decline of several native North American bird species. Starlings themselves are not native to North America. They were brought here in 1890 by a bunch of morons who were obsessed with introducing all the birds mentioned in Shakespeare's plays to the United States. Their mistake is a constant reminder of why moving animals from their native regions to other regions is a very dangerous practice. Sparrows are small birds who build elaborate nests in places like gutters, electrical boxes, illuminated signage, roof soffits, roll-up door housings, and other nooks and crannies of man-made structures. Because of their small size, sparrows can get into more places than pigeons or starling. They're very commonly found in illuminated signage, for example, where they build nests inside the letters and create both a nuisance and an electrical hazard. Because they're not very fearful of humans, they often nest in close proximity to people, for example, under porch roofs in occupied homes. 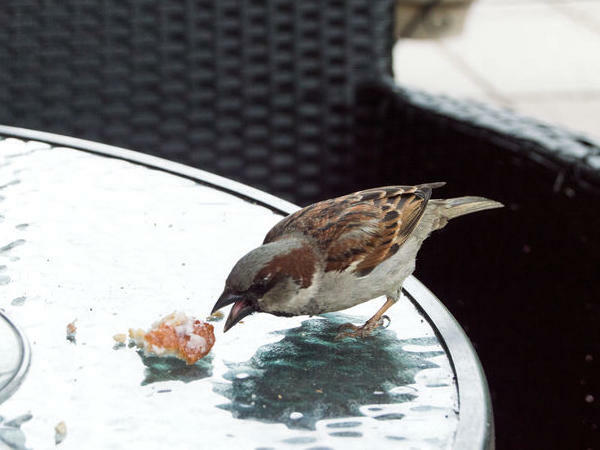 Sparrows can become a major nuisance when they clog rain gutters and downspouts, and their nests frequently cause electrical shorts and fires when they nest in electrical equipment. They also have become conditioned enough to eating humans' leftovers that they can become a major annoyance in outdoor dining areas and around dumpsters and trash barrels. Like pigeons and starlings, sparrows also were deliberately imported to the United States. They are not native to North America, and some believe that their aggressive nesting habits have contributed to the decline of some native bird species.